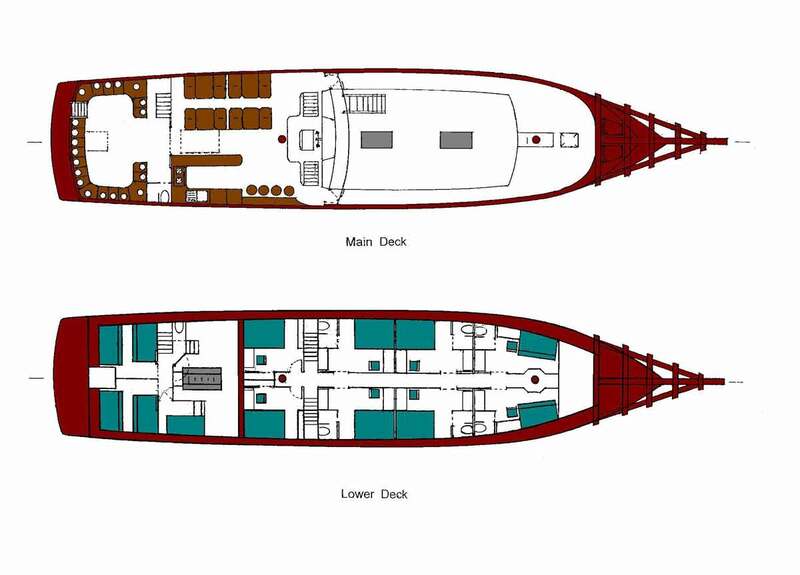 The SY Diva Andaman is 35 meters (115ft) in length with a seven meter (24ft) beam and over 200 square meters (2200 sq. ft.) of deck area. The huge vessel offers seven comfortable fully furnished cabins with marine seawater cooled air-conditioning, en-suite bathrooms and LCD screens with DVD players (or plug in your iPod or iPhone). She takes a maximum of 14 guests on her fabulous Andaman Islands, itineraries, to India, in April each year. SY Diva Andaman carries safety equipment for safe passage at sea including necessary first aid kits, Oxygen, a DAN oxygen kit, two 15-person SOLAS life rafts, and SOLAS life jackets for both adults as well as for children. The ship’s communication gear includes VHF radios, SSB radios for long distance communication in time of need, as well as CB radios, a GPS, radar, echo sounder, satellite and mobile telephones. The ship carries 4,000 liters of water, but can make up to 5,000 liters per day from her water maker. For you gas breathers, Nitrox is available on board. The SY Diva Andaman Andaman Islands liveaboard has five deluxe cabins with double beds and two cabins with twin bunk beds, as well as one triple cabin with a double below and single above. The triple cabin is perfect for a small family. Diva has a total of 10 bathrooms on board complete with hot and cold showers. Diva Andaman liveaboard operates both in Thailand and Myanmar and offers the occasional trip to the Andaman Islands in India. Phuket is the closest foreign port to the Andaman Islands. Andaman and Nicobar officials state that foreign boats must board passengers abroad and return them abroad, so all trips depart and return to Phuket. Therefore, Andaman Islands itineraries are 19 days in length. On the way you will dive the Similan Islands, the Burma Banks and the Invisible Banks on the way to Port Blair, Andaman Islands. There is never a dull moment. In the Andaman Islands you will dive Barren Island and Narcondam Islands, and Havelock Island in Ritchies Archipelago among other great dive sites and then return to Phuket for disembarkation. Diva Andaman liveaboard is available for individual bookings as well as charter cruises. Individual prices are listed below in the schedules and please contact us for charter prices. All Andaman Island departures are from Phuket, Thailand, serviced by Phuket International Airport (HKT). All ground transfers are provided from your hotel or the airport to the vessel. Please note: Approximately 45 dives. Itineraries are for general information only. We make no claims to being 100% accurate as there are too many factors affecting the schedule. We will give you the best diving on the best spots we can each day.